Silvan S. Tomkins was indeed one of history's most original psychologists, a tireless scientist who contributed much to that discipline. 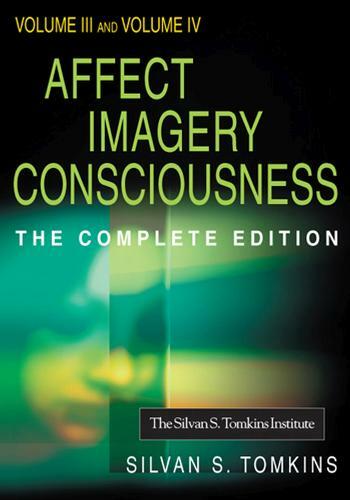 ""Affect Imagery Consciousness"" was his life's work and consumed him from the mid 1950s through the end of his life in 1991. With this book, he took on an enormous task; he sought to explore emotions, or affects, why we had them, why we paid attention to them, and how they motivated us to respond to situations in our daily lives.Tomkins believed that ""all life is 'affective life,' all behavior, thought, planning, wishing, doing...there is no moment when we are free from affect, no situation in which affect is unimportant."" He identified nine innate affects that humans possess, and from these, discovered a set of four highly specific behavioral requirements known as ""The Tomkins Blueprint for Individual Mental Health"", which states: as humans, we are motivated to savor and maximize positive affect. We enjoy what feels good and do what we can to find and maintain more of it; we are inherently biased to minimize negative affect; the system works best when we express all of our affects; and, anything that increases our power to accomplish these goals is good for mental health, anything that reduces this power is bad for mental health.These nine affects and this blueprint serve as a foundation for much of Tomkins' research and theories discussed in the volumes of ""Affect Imagery Consciousness"".